Recorded as Owan, Owen, Owens, Owin, Howen, and according to the International Genealogical Index - Oen, Oene, Onn, this famous name is most strongly associated with Wales. It is said to derive from the pre 7th century Celtic personal name Ouein, which itself was either from the word 'oen' meaning a lamb, or the Roman (Latin) 'eugerius, meaning well-born. Both may have contributed, because in any case the surname is first recorded, not in Wales, but far away in the English county of Warwickshire as shown below. 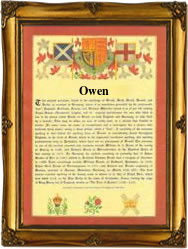 However for the past seven centuries at least, Owen has been probably the most popular of all Welsh personal names and is probably second to Jones in the list of surname popularities within the country. Some forty nameholders are featured in ancient Welsh legends and these include Owen Gwynedd, a 12th century chieftain, and Owain Glyndwr, 1353 - 1416, the greatest hero of Welsh history. He was the true Prince of Wales who established the Welsh parliaments and nearly became an independent King of Wales. He was defeated by the overwhelming forces of King Henry 1V of England. Other recordings which claim association with the name and taken from the early surviving registers of the city of London include Richard Oen, a christening witness at St Brides Fleet Street, on August 30th 1730, and Ann Onn who married Roger Smith at St Dunstans in the East, Stepney, on July 3rd 1791. The first recorded spelling of the family name is shown to be that of Ralph Owein. This was dated 1221, in the Warwickshire Assize Rolls, during the reign of King Henry 111rd of England, 1216 - 1272. Surnames became necessary when governments introduced personal taxation. In England this was sometimes known as the Poll Tax. Throughout the centuries, surnames in every country have continued to "develop" often leading to astonishing variants of the original spelling.